From an NPR contributor, investigative journalist, and one of Library Journal's "outstanding new voices," a striking debut novel that chronicles the first twenty-four hours after a mass burglary in a suburban Chicago neighborhood and the suspicions, secrets, and prejudices that surface in its wake. One of Vogue.com’s "Ten Best Suspense Books"
Rachel Louise Snyder is a writer, radio commentator, and professor of creative writing at American University. The author of Fugitive Denim: A Moving Story of People and Pants in the Borderless World of Global Trade, she has contributed regularly to NPR’s All Things Considered and she hosted the public radio series, Global Guru and Latitudes. Her writing has appeared in The New Yorker, The New York Times Magazine, Slate, Salon, The Washington Post, the Chicago Tribune, and the New Republic. Originally from Chicago, she has lived in Boston, London, and Phnom Penh, and currently lives in Washington, DC, with her husband and daughter. "Snyder's debut is smooth and engaging, and reads like the work of a veteran novelist." 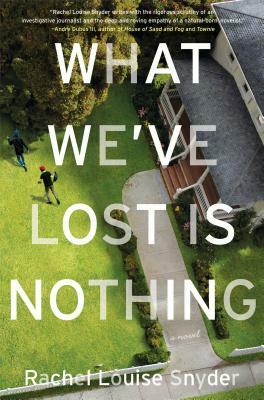 "In What We’ve Lost Is Nothing, Rachel Louise Snyder tackles a difficult subject, the effects of crime on a community. By exploring the lives of victimized neighbors, she shows how well-meaning people can fall prey to their fears and prejudices. It’s a story about an at-risk community skirting the west side of Chicago, but the themes are universal. It’s a compelling and important novel about family and neighborhood, about individuals when ideals and values are thrown into harsh contrast. A marvelous book." "Rachel Louise Snyder’s debut novel marks the arrival of an important new voice in fiction. With sharp prose and compelling insight, What We’ve Lost is Nothing brings readers to a neighborhood in a moment of public crisis that unmasks a range of private crises. Snyder renders a beautiful portrait of both the complex world of Ilios Lane and the gulf between the way that we imagine our worst fears, and the way that they come to pass and demand that we survive them." "Rachel Louise Snyder writes with the rigorous scrutiny of an investigative journalist and the deep and roving empathy of a natural-born novelist; the result is a bold and mesmerizing exploration of daily truths we don't talk about nearly enough: class prejudice and racism; the chasm between newly arrived immigrants and those of us who've been here for generations; the painful division between husbands and wives and the children they've made; and that razored air between what we believe and what is. What We've Lost is Nothing is a stellar debut by an important and necessary new voice among us." "A powerful, page-turning debut that dares to delve below the surface of our glossy American lives. You may never look at your neighbors—or yourself—the same way again." "Riveting . . . Snyder’s portrayal of the disintegration of this one quiet block is masterful, forcing the reader to examine the possibility of his own stereotypical behavior if faced with a similar situation." "Ideas abound in this thoughtful story, a demonstration of the author’s years of experience as a community organizer. What We’ve Lost Is Nothing has the stamp of authenticity." "Snyder's character development is astounding, as are the complexities of her writing. She manages to tackle some big issues including racism, city vs. suburb, violence, and the enigma of the human psyche -- all while telling a spectacular story." "[Gives] compelling expression to relevant and pressing issues of our time."